Explanation: Girdling the second largest planet in the Solar System, Saturn's Rings are one of the most spectacular sights for earthbound telescopes. 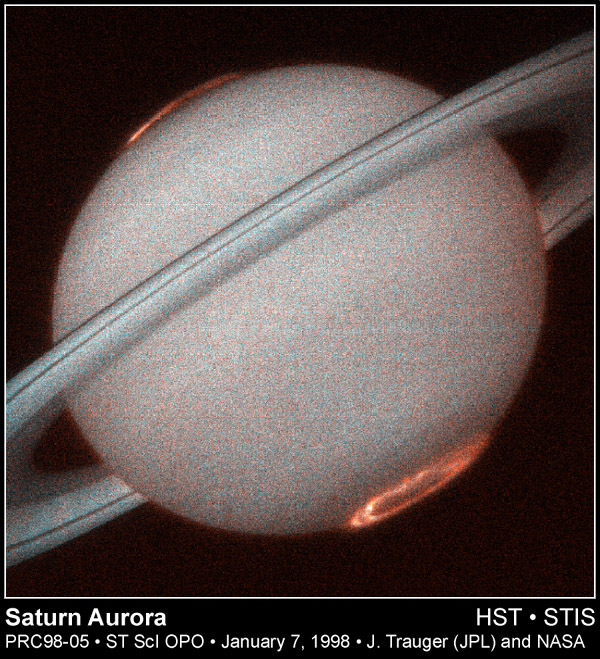 This recently released image, from the orbiting Hubble Space Telescope's STIS instrument, offers a striking view of another kind of ring around Saturn - pole encircling rings of ultraviolet aurora. Towering more than 1,000 miles above the cloud tops, these Saturnian auroral displays are analogous to Earth's. Energetic charged particles in the Solar Wind are funneled by the planet's magnetic field into polar regions where they interact with atmospheric gases. Following the ebb and flow of Saturn's aurora, researchers can remotely explore the planet's atmosphere and magnetic field. 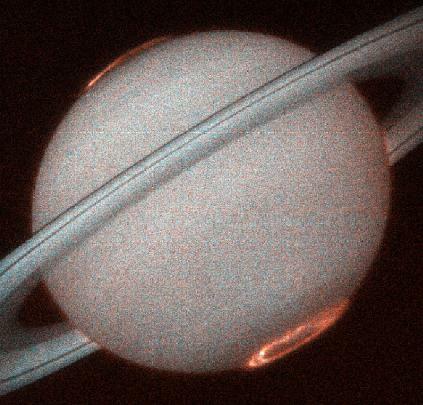 In this false color image, the dramatic red aurora identify emission from atomic hydrogen, while the more concentrated white areas are due to hydrogen molecules. In 2004, NASA plans to begin making close-up studies of the Saturnian system with the Cassini Spacecraft.